The first day of Adventure April is over. There are still 29 more days to go. Hello friends! 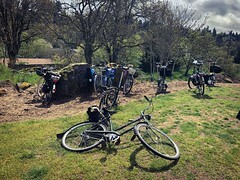 It is Tuesday, April 2nd, the second day of this year’s Three Speed Adventure April Challenge. So far, eight fine three speeders have signed up! It’s not about average grade, it’s about actual grade. So, look at the grade chart on the bottom of the map. Whatever section is 5% or greater is good for the challenge. 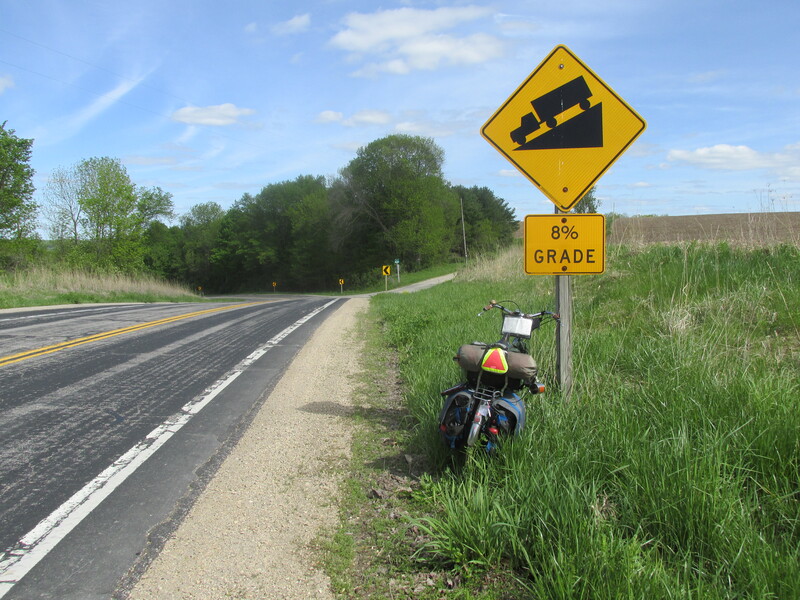 And if the hill isn’t long enough, ride back down, ride back up, rinse, lather, repeat until you have enough. 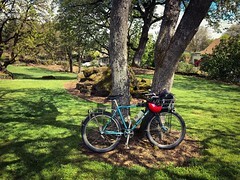 The distance challenge (15 miles or more) can have stops in it, like for lunch. The total ride just needs to be at or greater than 15 miles. Okay! I hope more of you accept the challenge. Remember, you still need to sign up for the challenge and adhere to the rules. You can do that over here. Finally, since someone asked: Yes, it HAS to be a three, four, or five speed internally geared bike. No, you can’t ride a single speed. This isn’t the Society of One Speed! 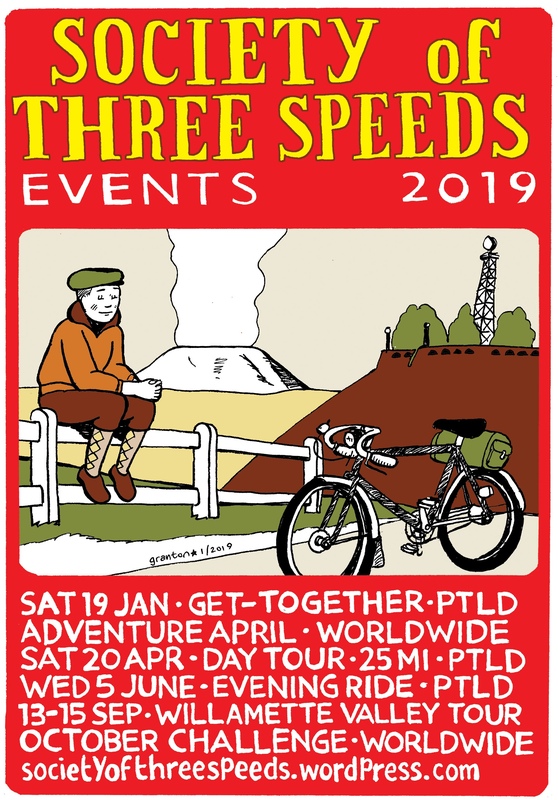 Announcing Three Speed Adventure April 2019! 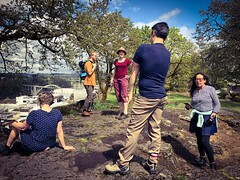 The Robin Hood path racer project at Mount Tabor. See, a three speed can climb a hill! Hello friends of Three Speeds! I skipped Three Speed October in 2018 so it’s been a year since the last challenge. And yes, it’s time for another challenge! 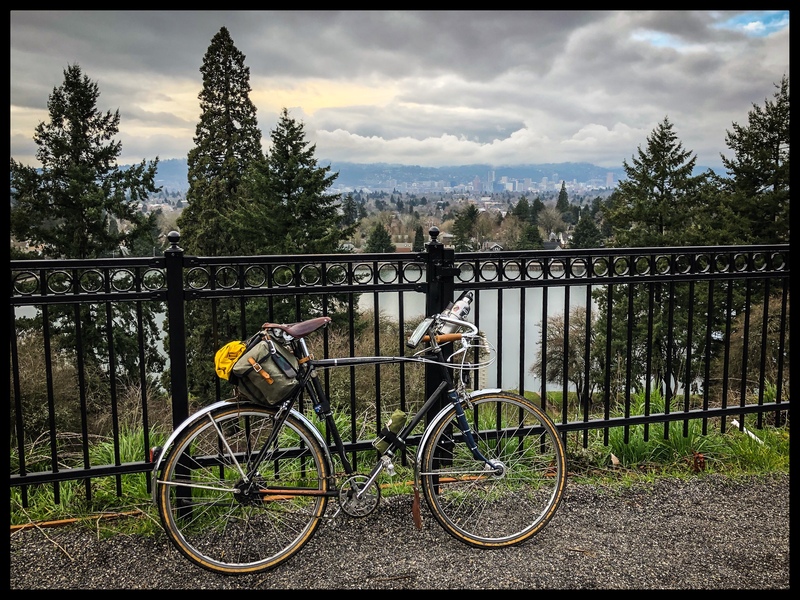 This challenge is about doing things with/on a three speed bicycle that some people would unfairly consider “beyond its abilities”. These bikes are more able than even some seasoned three-speeders think! This challenge is open to any three speed internally geared bicycle, of any year, any country, any. Four and five speed internally geared bicycles also welcome to participate. No derailleurs. You’ll find every little detail about the challenge here. And unlike Three Speed October, it’s about quality not quantity. You can do all the challenges individually, do them all together, or in any combination you see fit! You’ll have all of May to submit the reports of your challenges. Deadline for submission is 11:59 PM PDT on Friday May 31, 2019. Find the forms onerous? Don’t do the internet? You can submit your challenge reports by mail! Please get in touch with me first (either by email or by post, address below). You will still have to submit the same report information that you would if you do online. You’ll also need to send me a pic of the bike (or bikes) you’re using, and if you can’t do that, you’ll need to send me a drawing instead. (And I don’t care that you “don’t know how to draw”.) You can submit postal reports individually or together. Reports will need to be postmarked no later than Friday May 31st. Prizes! You qualify for a one-inch button for each challenge you do. If you hit at least three of the sub-challenges, you’ll qualify for something special (to be determined). If you can do all five, great! But you won’t get something else beyond five buttons and the something special. Please note: It will cost between $5-15 to get the prize pack, plus shipping. Anyone who completes at least one (and any one) of the challenges will qualify for a discounted Society of Three Speeds membership! For 2019, this discount price will be $15 plus shipping. Get in touch with me directly to get info on purchase. Okay! Looking forward to your participation! Please fill out the form below if you want to participate. The form will be open until May 1st. Once you complete the registration form, you’ll be sent the Challenge Completion form during the first week of April. Three Speed Adventure April prize packs are HERE, finally! Hey folks! I emailed a bunch of you about this, but there’s always a chance you didn’t get. And if you participated in either the 2017 or 2018 Three Speed Rides that happened in April, you qualify for Challenges 1 through 4. After much procrastination, I have finally gotten around to getting the prize packs for both the 2017 and 2018 Adventure April challenges done! Woot! And if you have completed some of the challenges, you qualify for the prizes! ​A word about the prize pack: Basically, it’s a “merit badge” for each challenge you completed. These are one inch buttons depicting the challenge. So you get one for each challenge you completed. Alas, no patches, since the participation has been light (just 10 for this year), and I can’t justify the expense right now. Also, the design is the same for both years. If you did Coffee Outside in both 2017 and 2018, you’ll get the same button, but twice. Paypal me at urbanadventureleague@gmail.com the appropriate cash for buttons plus shipping. Each button is $1. You get one button for each challenge you complete for each year. If you did Distance-Coffee in 2017 and then Climb-Rough Stuff-Coffee in 2018, that’s $5 total. Shipping is $4 for US, $10 for Canada, $14 for anywhere else. Please add this to the button cost. Unfortunately, buttons have to go first class package, and that’s expensive. I’m not trying to make money off of this, but if I try to “sneak” it by with postage for a first class letter and it gets returned, I’d be eating the additional shipping cost. And yes, this has happened to me. Either in the notes when you Paypal me, or in a separate email to this address, include your mailing address, and what buttons for what year. I’m trusting you to tell me which challenges you have completed, but if you have forgotten, let me know and I’ll figure it out. If you don’t have paypal, I can send an invoice via PayPal that you can pay with a credit card. Oh yeah, I also can accept payment via Square Cash. Let me know if you want to do that. If you don’t want to do Square Cash or PayPal, get in touch and we can figure something out. Be advised I don’t like taking personal checks. If you live in Portland, we can arrange a pickup for cash so you don’t have to pay shipping. Please note that this pickup is either going to be at my work on SE Hawthorne or at my house in NE (Woodlawn), at a time that works for me. I’m not going to deliver buttons, my life is too hectic. 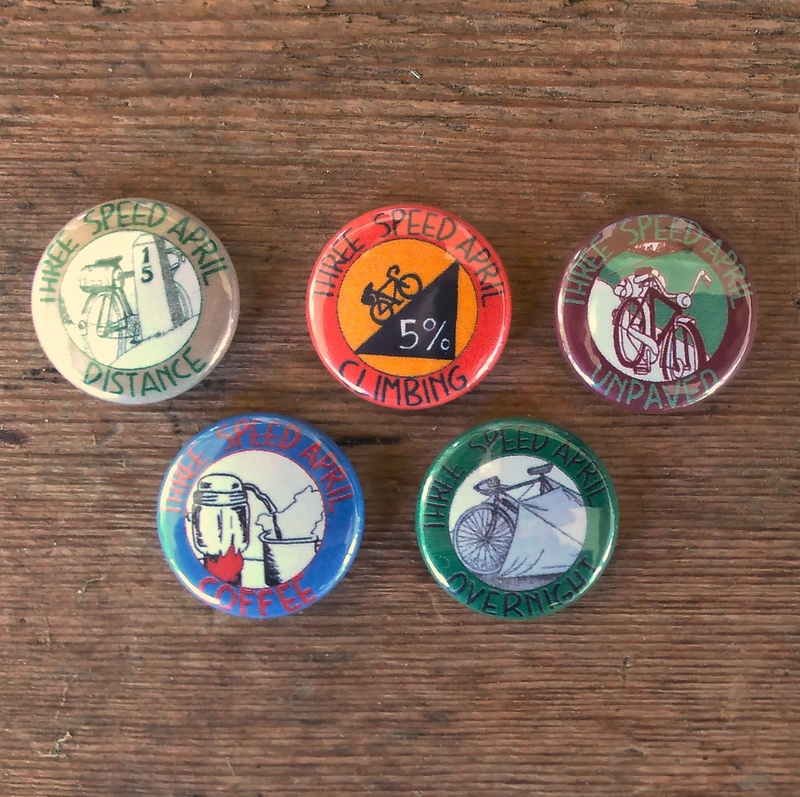 Also, if you live in Portland, I’ll have the buttons at the Three Speed Ride this Wednesday June 27, and also the Sunset/Moonrise Ride on Thursday June 28. And if you just don’t want the prize packs, that’s fine. If you have any questions, please let me know. Thank you for participating!